Access to modern, safe, affordable and sustainable energy is increasingly recognised as crucial for development. There is strong evidence that reaching the estimated 1.2 billion people still without access to electricity and the nearly three billion who lack clean, safe and efficient ways of cooking requires a greater focus on decentralised energy services. For energy access to make a real difference to the lives of men and women living in poverty, ‘delivery models’ for energy services must be adapted to different local contexts, rather than adopting a “one size fits all” approach. IIED and CAFOD are working together to understand better how these models can be customized to provide a better fit with the varied socio-cultural realities and needs of people living in poverty and driven by local demand to make them scalable, successful and sustainable over the long term. 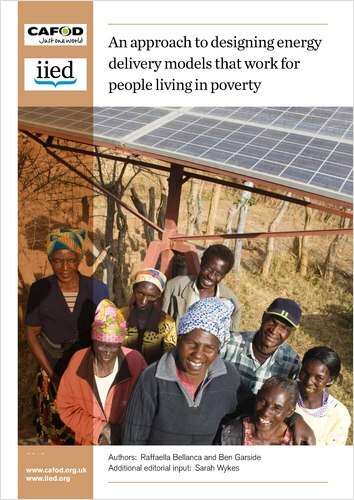 As a first step in this collaboration, IIED and CAFOD have produced the paper, An approach to designing energy delivery models that work for people living in poverty, (English and Spanish) which outlines guidelines for participatory analysis to understand the needs and wants of potential end-users of energy services and identify possible actors in the energy supply chain. This CAFOD and IIED approach to designing energy delivery models builds on research by IIED and others such as Practical Action. More information on the concept of the energy delivery model and relevant case studies can be found in IIED’s publication Sustainable energy for all? Linking poor communities to modern energy services. This approach to designing energy delivery models and the associated tools were presented at a multi-stakeholder workshop held in Managua, Nicaragua (24-25 June 2013) with CAFOD partners from Central America and South East Asia, representatives from academia, government, NGOs, donor agencies and decentralised energy service providers. Positive feedback from the workshop and from peer-review of the paper have demonstrated demand for developing this approach into a methodology that can be adapted to different contexts to design future energy services that can meet the needs and wants of poor men and women more successfully and sustainably. It can also be developed into a tool for analysing, improving, and scaling up existing energy services. We hope this collaboration will also interest a wider audience in the context of current discussions among decision-makers, donors and practitioners (social businesses, development agencies and civil society organisations) on approaches to implementing and scaling up access to energy services for people living in poverty (so-called ‘bottom-up energy solutions’). Most notable among these are discussions around the post-2015 development framework and the UN’s Sustainable Energy for All initiative. In particular, we hope this collaboration will contribute to building a greater understanding among decision-makers of how to tailor delivery of energy services to the real needs and wants of end-users living in specific – and varied – socio-cultural contexts. Building on the Managua workshop, IIED and CAFOD will now develop further our approach to the design of energy delivery models by piloting it in different focus countries and socio-cultural contexts. This will involve working more closely with our partners and other interested actors to develop the methodology, identifying and eventually implementing pilot projects and building a knowledge platform to share learning. This collaboration between IIED and CAFOD aims to better understand how energy services can be designed to work for people living in poverty in order to maximise their developmental benefits and to ensure energy services operate sustainably over the long term.